THIS PIRATE TIKI IS HAND CRAFTED, HAND CARVED, AND HAND PAINTED, THIS EXOTIC WORK OF ART IS APPROXIMATELY 12" TALL. IT IS CARVED FROM A SOLID PIECE OF TREE TRUNK. OUR HAWAIIAN TIKI HEAD IS ALREADY SEALED FOR OUTSIDE USE, NOT LIKE OTHERS THAT SELL TIKI MASK. GIVE SOMEONE A SPECIAL GIFT THEY WILL NEVER, EVER FORGET ! 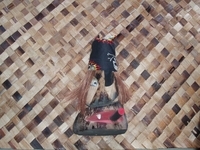 BUY TIKI MASKS FOR SALE ONLINE TODAY AND GET FREE SHIPPING.